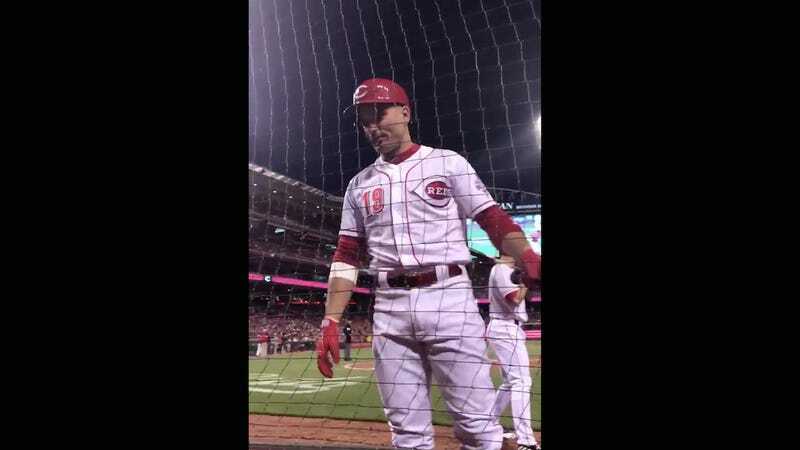 Reds first baseman Joey Votto, who every now and then participates in the clowning of a lunkhead, engaged in repartee with an Indians fan at Monday’s game in Cincinnati. Indeed, Votto hit a double to deep center in the bottom of the sixth, but was doubled off second to end the inning. Reds fan Keegan Haag took a video of another part of the conversation between the two. “I remember when you used to be good,” the unseen fan said. “I remember when you used to be thin,” Votto shot back. The Indians fan razzed Votto for getting doubled off, which is when Votto stopped playing along. “Right now, this guy is filming this. I’ve got something to lose,” he said. “You guys don’t even have a life, so you’ve got nothing to lose at all.” Joey Votto is not only cold-blooded, but self-aware—like some sort of Canadian T-1000.